Should not matter where on the loads order, no conflicts with other mods. added T-pieces & cross-pieces to the log fence menu. Also roadbound variants. added new Village Stone Wall (this was a fence that didn't make it into DSSV). - updated into new community-DS toolbar locations. - changed file directory and names of DSSV fence. - Log Fence Junction pieces (T-piece & Cross-piece), all 4 color styles. Also decorative-road-bound variants. - Village Stone Wall (straight, long straight, cnr, end, T-piece, cross-piece, overhang, gates) and lots of variants. - Changed string name of 'Town Stone Wall' menu to 'Town and Village Stone Walls'. - Fixed issue with Decorative Stone base lanterns not displaying texture correctly. - Modular Fence components (early-release), decorative-road-bound, 2 styles. - Country Stone Wall, single-tile Gate, 5-long Straight, Storage 2x2 Corner, Angle pieces. 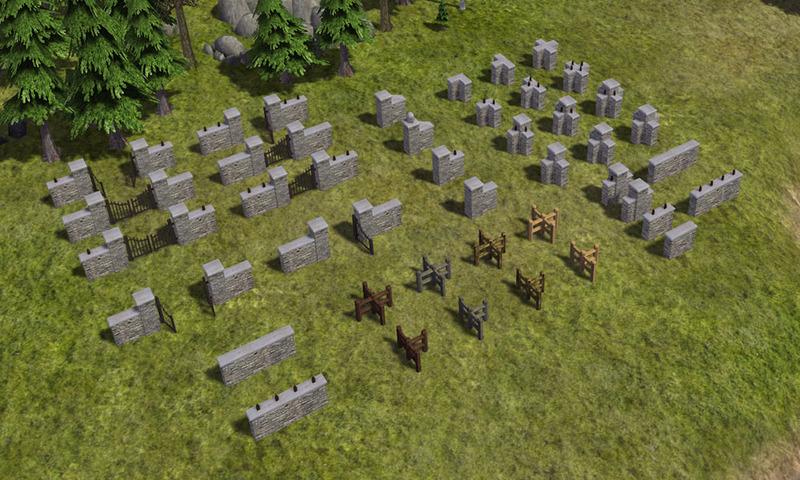 - Decorations:	Added angled variants of small wagons, post lanterns and wall lanterns. - Decorative 'Welcome' & 'Welcome to town' signs added. - Log/Horse/Brushwood Fences, decorative-road-bound alternatives, via Fence menus. - Horse Fence 'Overhang' and 'Non-Flattening' pieces added. - 'Remove Structures' Tool added to DSFences toolbar menu. - Town Stone Wall & End variations. End variants, plus overhang and angle pieces. - Adjusted angles and locations of decorative ladders. - Adjusted size of decorative wagons, barrels, crates/boxes. - Town Stone walls and ends menu's combined. - Various string texts altered.